Which came first, the ice cream soda or the cream soda? 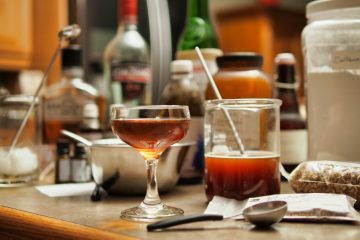 Neither, they pretty much started as the same drink and took different evolutionary paths to become the two types of drinks we have today. So how did that happen? It begins with cholera. When you go back in history, especially drink history, you will come to realize that disease was everywhere. Water and ice were vectors for things like cholera and dysentery. Contaminated water sources were part of the reason everyone suffered from dyspepsia in the 1800s and bitters, medicinal tonics and snake oil were sold on every corner. This led to some unusual behaviour. 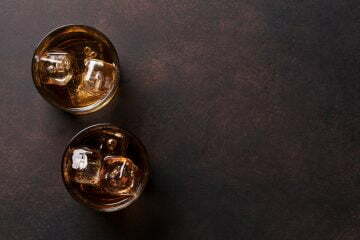 One of the beliefs many people held was that ingesting ice or cold drink was unhealthy and going as far as to say that swallowing an ice cube could cause stomach spasms that could kill you. Ice couldn’t kill you, but what was lurking in the ice could. 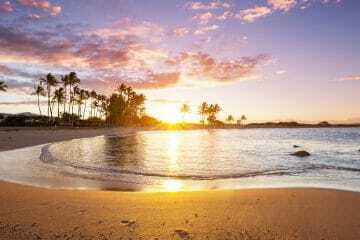 Almost all ice in the 1800s was harvested from frozen lakes and ponds, but as cities grew and people spread out into the country those once clean lakes became places to deposit sewage. This made clean ice harder to find. Instead of adding ice to drinks the ice used to chill or freeze the ingredients, at least at the soda fountain—saloons were a little earthier. In the case of ice cream soda, they just used the ice to freeze the cream, and then put the frozen, uncontaminated cream into the drink. The first soda that used cream and gained popularity was the Ice Cream Soda, which was reported in the Lowell Daily Citizen and News (Lowell, Massachusetts), on Saturday, July 19, 1856. At the early soda fountains, ice cream was merely frozen cream, though flavoured version did exist they were difficult to keep without modern refrigeration. Mr. A. W. Dows, No. 185 Central Street, has contrived something novel in the way of drink, being ice cream soda. It is not only novel but exceedingly palatable and refreshing. Those who like good drink will give him a call. 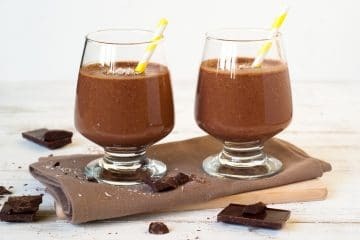 The recipe was quite simple, a spoonful of chilled or frozen cream, placed in the glass with a flavour syrup and a coarse stream of soda water added from the fountain to mix it up. Cream often wasn’t real cream, just doctored milk. Sugar and cornstarch were added to milk to thicken it up, plus other additives like sweet almond oil for “body” and sodium bicarbonate to neutralize the lactic acid from fermentation. Some pharmacists made a cream syrup, which I detailed previously, and it works surprisingly well in soda or anything you need a creamy texture added to drink. The most popular flavour in the early days was vanilla or a combination of vanilla and pineapple. 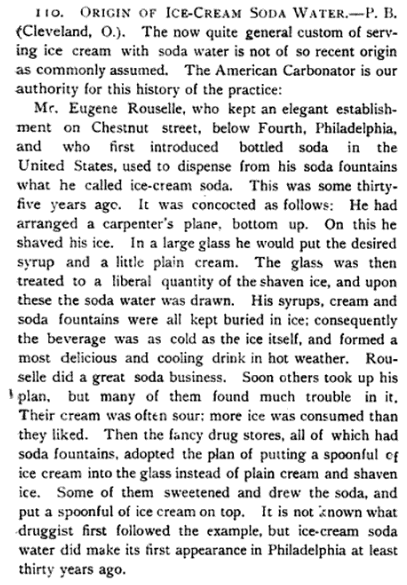 Other versions of history exist with the clip below from the Western Druggist, Volume 14 (1892) putting the creation event in Philadelphia circa 1857. That still leaves Mr. A. W. Dows ad as the earliest mention by a year. These “first to invent” articles come up frequently, because of the competitive nature of men. 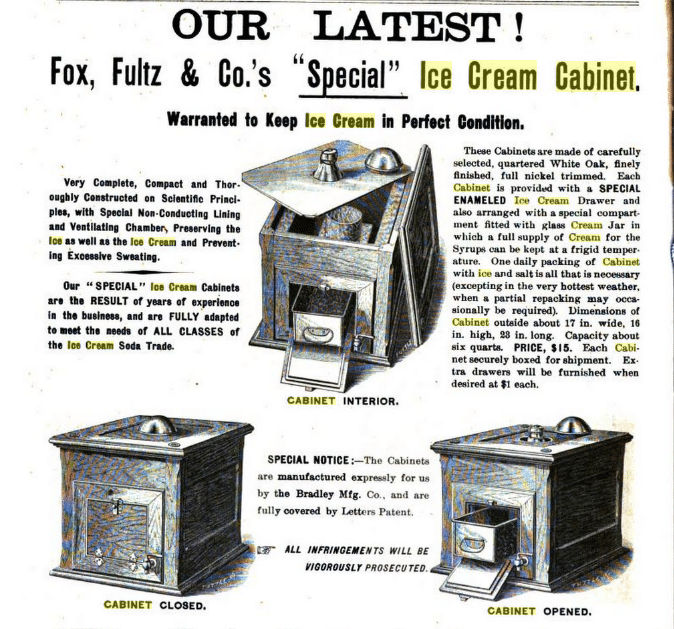 Ice cream cabinets were even invented to freeze the cream and avoid contact with the ice. An example was advertised in The Pharmaceutical Era, Volume 13 (1895). This invention kept the ice and cream separate. The reason they mention “terrors” was mechanical refrigeration was still not commonly available to small businesses. 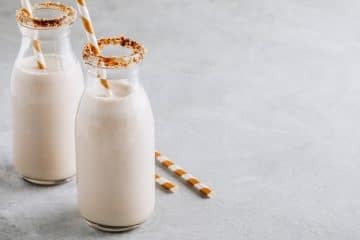 Raw, unpasteurized milk products and warm summer days don’t combine well, and many of the lesser soda fountains were notorious for making their customers ill. The best soda fountains made an intense display of cleanliness and spared no expense making the fountain look like a reputable place of business. Whipped Cream Soda was another confectionary that branched off of the cream soda craze. 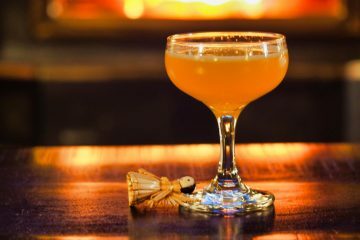 A literal reading of the drink name will provide you with the historical drink equivalent. 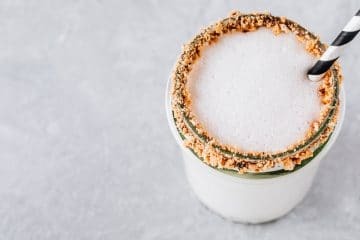 The whipped cream was either floated on top of the soda or occasionally put into the glass, and then syrup and soda water added to mix it all, giving a light frothy drink. 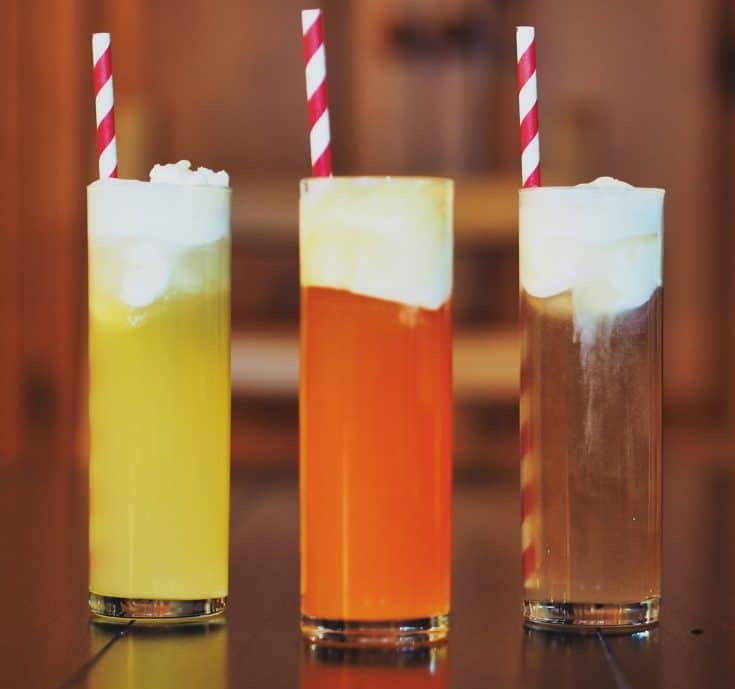 Around the Internet, you will find other articles talking about the cream soda, and you will discover that the modern belief is a cream soda is just vanilla flavour soda water, historically that is wrong though in modern times that is what you get. Wikipedia mentions a couple of patents. Cream soda wasn’t patented, per se, but a method to make instant cream soda at home without a soda fountain was the invention. The mixture of sodium bicarbonate and an acid like citric or tartaric acid (cream of tartare) goes back to at least the 1700s as a way of making carbonated water. There is a Bon Appetit article titled “Why Is Cream Soda Called ‘Cream’ Anyway?” that makes some overreaching assumptions and is a bit of a fluff piece. The writer speculated that the “cream” comes from the use of cream of tartar in a recipe from the Michigan Farmer, Volume 10 (1852), but this recipe is for an instant, sweetened sparkling water. 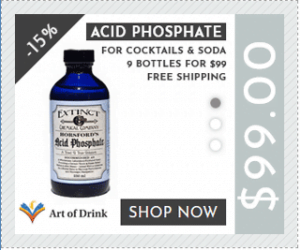 You’d mix an acid (tartaric acid) with soda (sodium bicarbonate) in a glass of water, and it fizzes. It was common practice for decades to simulate a poor man’s sparkling water this way. 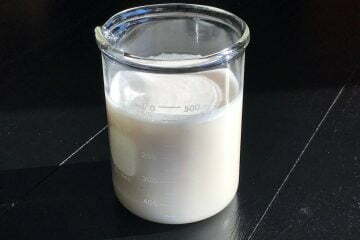 The milk and egg in the recipe were used to clarify the liquid as sugar, and the powdered acids weren’t pure like they are today. The cream in the name of this 1852 probably refers to the French technique of creating crème liqueurs. 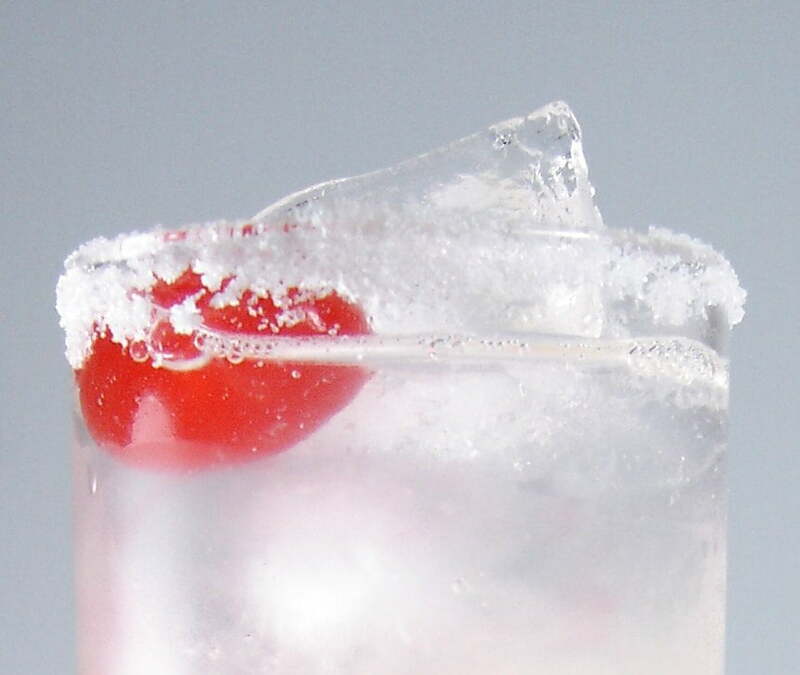 The Bon Appetit article currently ranks #2 in Google search results and unfortunately has probably influenced tens of thousands of readers to believe that the cream comes from a “creamy finish” or “cream of tartar.” Occums Razor applies: cream soda comes from the addition of cream to soda and is easily proven with some simple historical research. Mind-blown, I know. Why Did Cream Leave the Soda? Multiple events happened that culminated in the disappearance of the cream soda. Health issues were a major one. In the early 1900s health standards were starting to be enforced and soda fountains were a primary target. The use of raw milk in drinks was a direct link to outbreaks of Salmonella, E. coli, Listeria, Campylobacter, often reported in newspapers. In New York in the 1890s 1 in 4 babies died from raw milk consumption. Pasteurization of milk only became common in the US in the 1900s. Chicago started enforcing that standard in 1908, and it took many years for other city and state to fall in line. Removing the cream from a drink lessened the contamination issues. Price and the convenience of bottled soda were other factors, as well as the onslaught of ice cream treats like the milkshake, sundae and banana split. These things just made the simple cream soda less appealing. 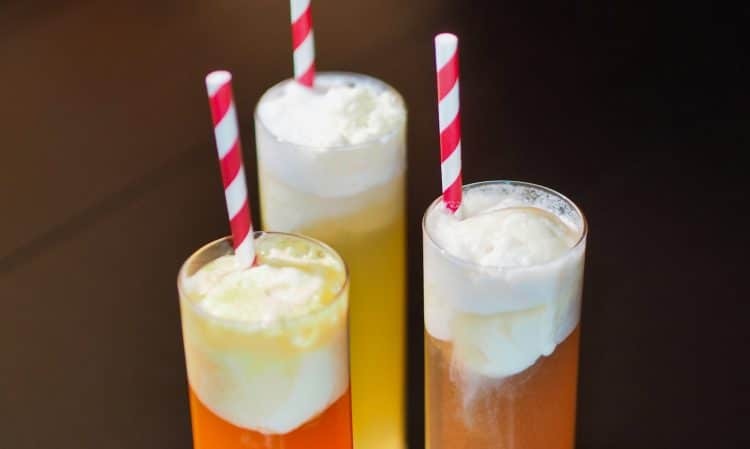 The ice cream float, rootbeer float or Coke float is the closest modern-day equivalent and still, an enjoyable summer day treat. We can thank science for this as modern refrigeration and pasteurization make this a safe drink once again. Though it is a trendy term, historically, there is no such thing as Italian cream soda. The Torani Company in the 1920s usurped the idea of soda and applied the word “Italian” to make their products more marketable. Hence Italian Soda. If you use frozen cream or ice cream, in step two, using two spoons, create an ice cream ball small enough to fit into the glass and float it on the soda. Though we have different names for cream soda, ice cream soda and a float, they all stem from the original ice cream soda. 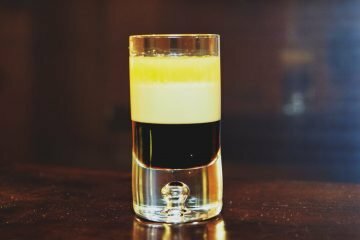 So whether you just add cream, float ice cream or incorporate whipped cream the spirit of the drink is the same: dairy and soda. Typically, ice wasn't added to sodas until the 20th century. All of the ingredients were kept cold, on ice and even the glasses could be chilled. Serving a soda with out ice called a "solid". 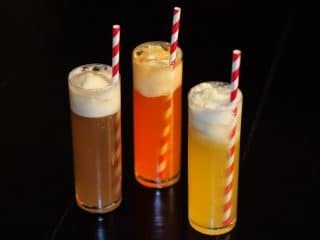 If you make the cream syrup recipe in the previous post, which has butter flavouring added, you can add some of the cream syrup to a soda, like root beer, to make Buttered Root Beer or try adding some cream syrup to a vanilla flavoured “cream soda” then you will have a real cream soda. 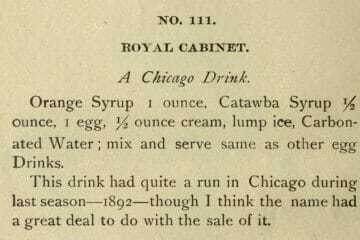 This article may not be the final say on the subject, new research material is always being unearthed, but from what I’ve researched, the first mentions and recipes for cream soda come from the 1850s. There are old confectionary shop ads from the 1820s that list menu items as “ice cream, soda, lemonade” but that comma makes them separate drinks. That’s not to say someone didn’t come into the fountain and think that there was an “ice cream soda lemonade” on the menu and a compliant soda jerk mixed one up. Discovery and documentation are often decades apart.